Fans of labyrinths and puzzle boxes have a reason to love Jean Claude Constantin's new puzzle, the PLD Box (also known as Laby Box), since it combines these two distinct concepts perfectly into a brilliant and unique puzzle. As you know, a puzzle box has a hidden mechanism or some other locking device that needs to be deciphered in order to open it. However, this box is a little different, because the locking mechanism can be seen. It's a labyrinth, but don't think it's easier than any other puzzle box. In order to open this box you have to solve the labyrinth and remove its acrylic cover. I was pleasantly surprised with the quality and overall design of this puzzle. It is quite big and sturdy, measuring 12.5cm x 9.7cm x 6.5cm. The body of the box is made of this lighter shade of wood, almost the same color as bamboo, but I'm not sure exactly what type of wood it is. 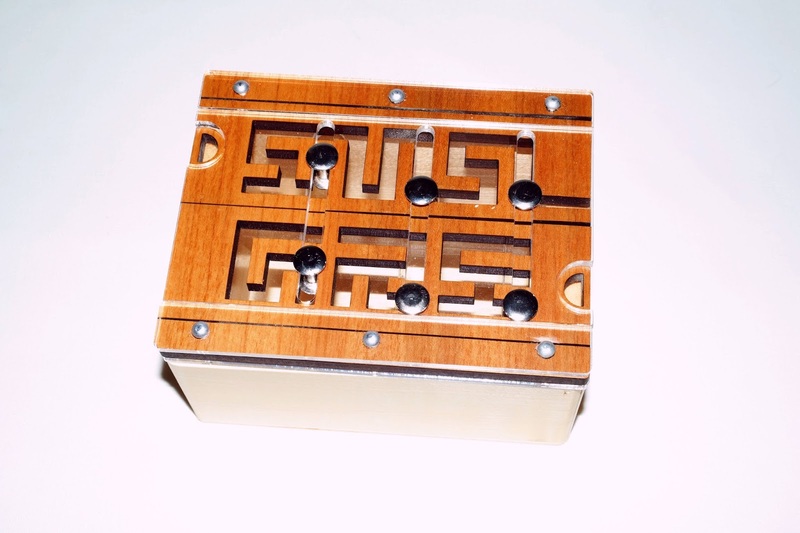 The top of the box is decorated with a geometric maze consisting of two sliding plates that move in opposite directions. The goal is to navigate the two mazes by moving the six pins up and down while pulling on the plates back and forth. Only one of the plates can be removed, as you can see by carefully analyzing the mazes. Only one of the mazes is actually linked as one continuous path. The other maze is separated into three different path that are not linked together. The pins can't move independently from each other. They move in pairs vertically, so you have to solve both mazes simultaneously, always planning your moves strategically. With each move you'll have to move some pins up, others down, or you won't be able to slide the plate out of the box. 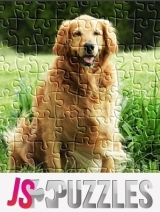 The difficulty level of this puzzle is very high, because of the high number of moves involved in the solution. To remove the cover you have to repeat many of the movements, as if you were following a logic sequence. Once you understand the logic behind the maze, you'll solve the puzzle in no time. 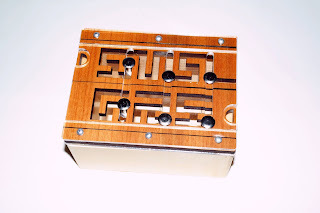 The PLD Box by Constantin is one of his best puzzle box designs. The combination of two different concepts works flawlessly and solving one will be a great accomplishment accompanied by a rewarding feeling. Availability: The PLD Box is available at Brilliant Puzzles for $39.95 USD. There are also many other interesting Constantin's designs.